If you search “Sherline” on YouTube, you will find a plethora of videos put up by Sherline customers. Sherline users are not only producing high-quality pieces with their Sherline machines, but many of them are also producing high-quality videos showcasing their work. They offer great how-tos and reviews on a variety of topics. These videos are the property of their creators and are unsolicited by Sherline. A great collection of videos ranging from how to set up Sherline lathes and mills, discussing safety and terminology, to machining projects. Following is a list of links to his sites and some of his videos. Clickspring is a home machine shop channel, with a focus on clock making. Following is a list of links to his sites and some of his videos. 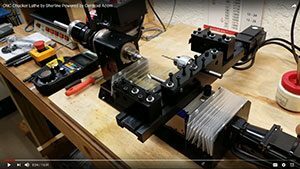 Ken Condal has put together a series of videos highlighting many of his machining projects. Following is a list of links to his sites and some of his videos. Downriver Tools is a Sherline dealer that specializes in producing plan sets, and soon, finished tools and accessories to convert Benchtop and Tool Room lathes into production turret lathes. Following is a list of links to their sites and some of their videos. Igor creates beautiful DIY videos while creating cool objects, turned on a Sherline 4400 lathe, like a mini cannon and a ring crafted from a piece of meteorite. In addition to working with metals, he also shows his skills in woodworking, leather craftsmanship, and electronics. Joel Hercek builds custom, one-of-a-kind cues for each of his customers. Hercek has built cues for some of today’s most famous players and astute collectors. Bob Dzuricky makes custom pool cues using a custom-built Sherline lathe mounted to a CNC Router. Carlos Vicente is producing helical gears on a Sherline mill without the aid of CNC. He prefers using more traditional methods when machining his projects. He is so “Old School” that he even has a steam engine that can run his lathe. To see more of his projects check out his YouTube channel. The videos are in Spanish, but he has provided English subtitles. Video: This video demonstrates how you can use a rotary axis to machine a wax master for a ring on a Sherline CNC milling machine. 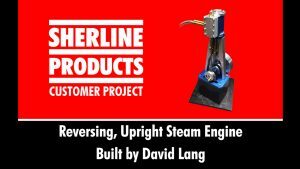 David Lang sent us a video of his Reversing, Upright Steam Engine to share with other builders. If you have a video that you would like to share, you can send us your high-resolution footage and a short description, and we will prepare it for inclusion in the Customer Project Videos playlist on our YouTube channel. Franco CNC powers his chucker lathe with Centroid Acorn. He gives a quick run-through of the various standard and optional equipment that comes with the chucker lathe, and a review and demonstration of this new industrial offering from Sherline Industrial Products Division. CLICK HERE to visit the Sherline IPD Chucker web page.